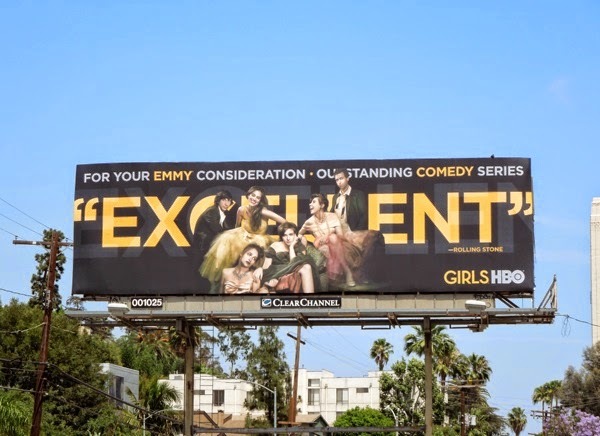 There are lots of benefits of a cable channel or TV network for garnering as many accolades as possible, and that's why HBO always does a fantastic job of highlighting its wide variety of drama, comedy and informational shows with its Emmy Consideration ad campaign. In the short term there's all the marketing advantages, from raising the profile of a show to encouraging new viewers to give your series a chance if they haven't already. In addition it's a way for the channel to demonstrate they are supporting their talent and a win can mean lots more career and monetary opportunities for the actors and creatives involved. Other benefits of awards wins can include increases for ad revenue or subscription rate fees and in the longer term, a popular show has more chance of achieving favourable syndication rights at a higher rate. 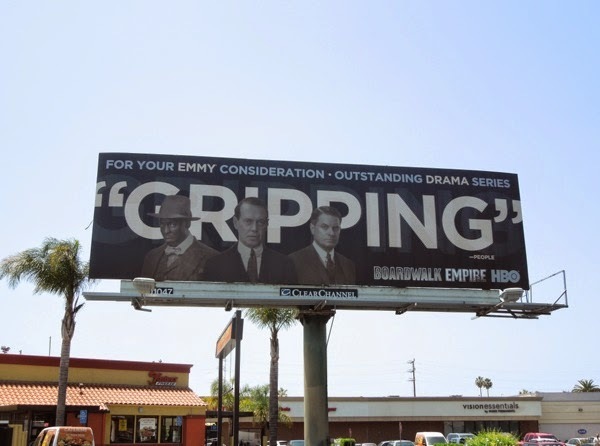 So you can see why HBO has gone all out again this year to make they Emmy billboard campaign stand out in an already crowded city skyline. 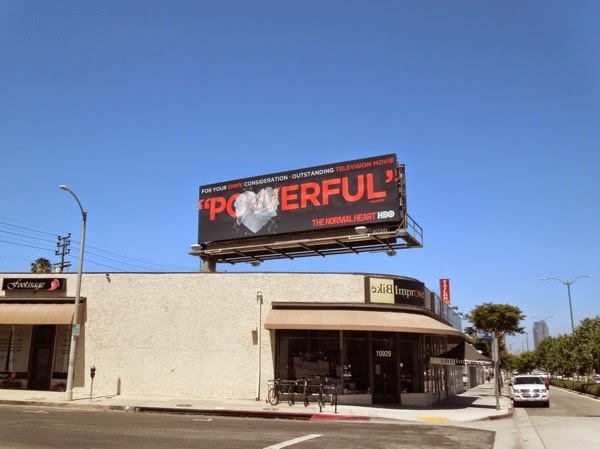 This year the cohesive ad campaign once again focuses on key descriptive words for the shows, taken as quotes from various established magazines and media websites, as a backdrop for the seasons key promo art, which makes for some compelling visuals. 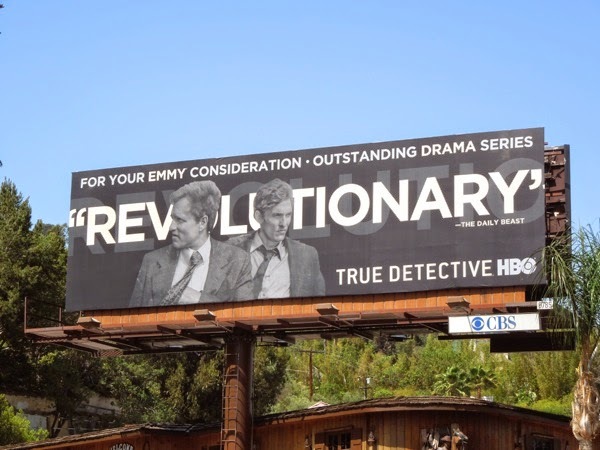 If you like this year's campaign, be sure to also compare these ad to HBO's 2013 Emmy Consideration billboards from last year which used a similar tactic. 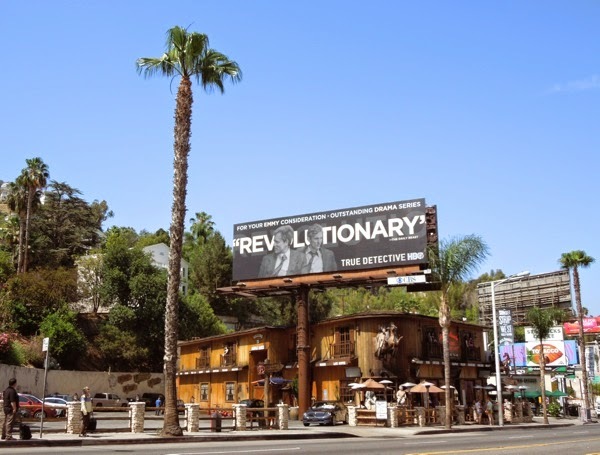 The 'Revolutionary' True Detective creative and 'Excellent' Girls billboard were spied first on May 19, along Sunset Boulevard and Highland Avenue respectively. 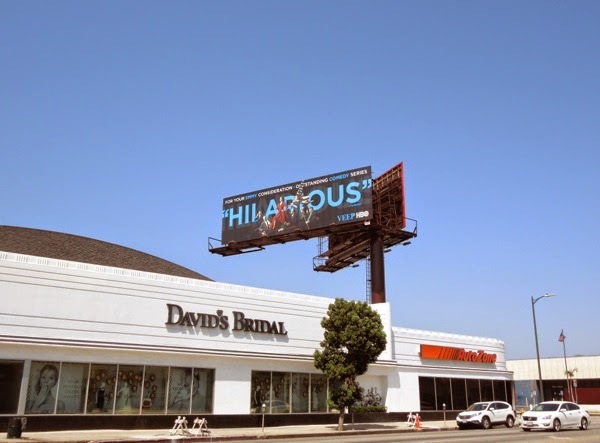 The striking red 'Genius' billboards for HBO's new comedy Silicon Valley's debut season, were spied along Olympic Boulevard and San Vicente Boulevard on May 21, 2014. 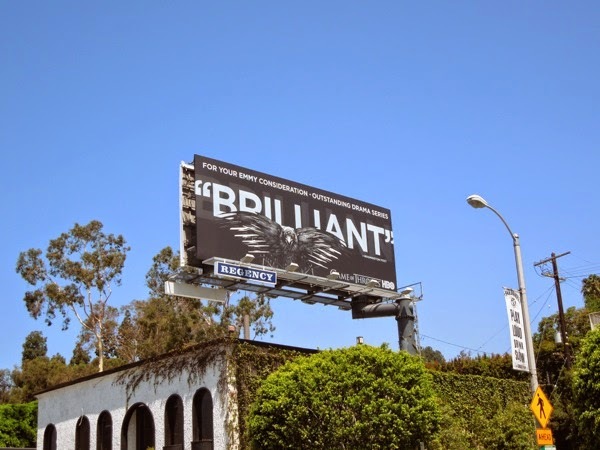 The eye-catching crow from Game of Thrones fourth season billboards was paired with the word 'Brilliant' and spotted along Sunset Boulevard on May 25, although maybe 'Shocking' or 'Deadly' would have been better choices of adjective. 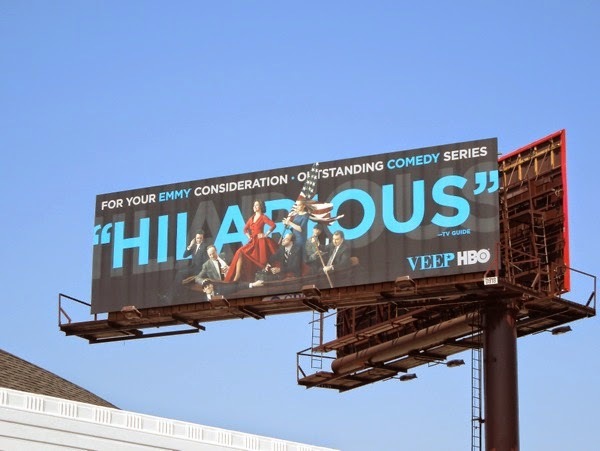 Meanwhile 'Hilarious' is the perfect choice of words for Veep's third season which has truly found its comedy groove and was photographed along Pico Boulevard, whilst Boardwalk Empire's 'Gripping' ad creative and Vice's 'Visceral' billboard were snapped along La Cienega Boulevard also on May 25, 2014. 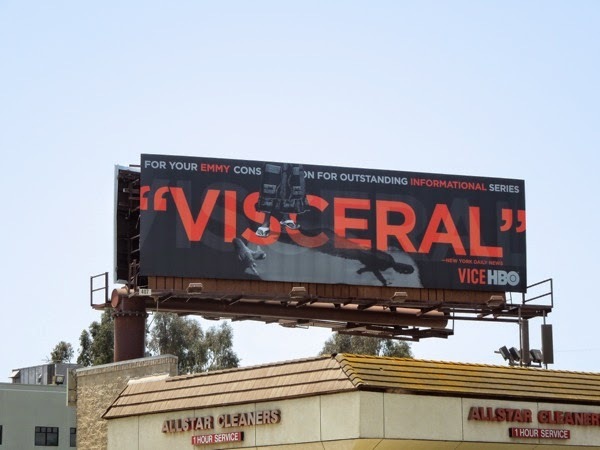 Daily Billboard has yet to spy a creative for The Newsroom or True Blood (although the series is just kicking off its campaign for its seventh and final season), but we're sure there may be other HBO Emmy billboards yet to come. This impactful campaign is sure to capture Emmy voters imagination and secure a few nominations for this year's 66th Primetime Emmy Awards ceremony hosted by Seth Meyers on August 25, 2014. 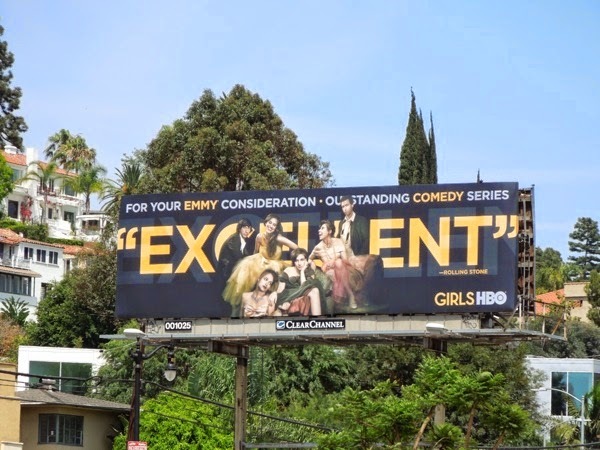 Plus for another fantastic Emmy Awards campaign to encourage nominations, be sure to check out Mad Men's vintage style Emmy 2014 billboards which feature the period drama's characters in mock product ads from the 60's. 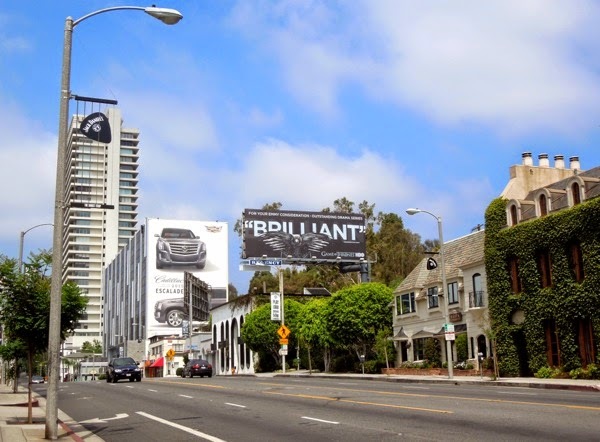 UPDATED: Daily Billboard couldn't resist sharing another shot of the Game of Thrones creative on a much clearer day to show you how striking it truly is, plus to let you all know that this Emmy outdoor campaign was designed by SJI Associates in New York City. 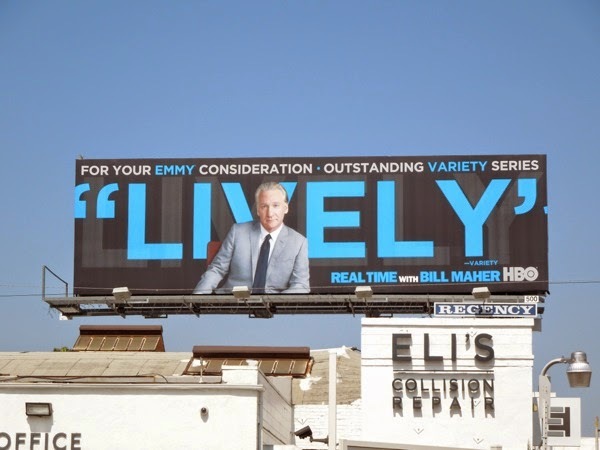 Plus here's a 'Lively' creative for Real Time with Bill Maher for the Emmys variety category, spotted along 3rd Street on June 13, 2014. 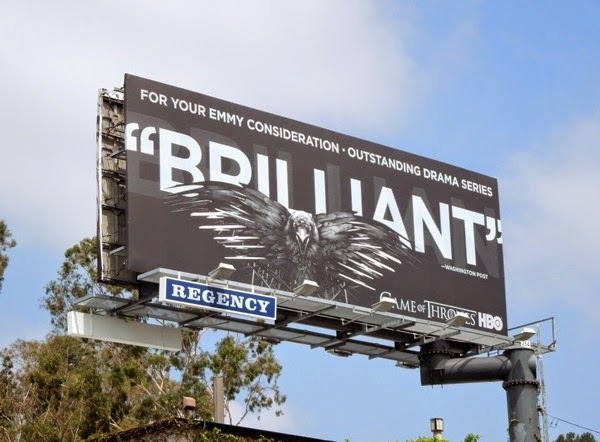 UPDATED: Here's another HBO Emmy billboard recently arrived in the skies of L.A., this one spotted along Santa Monica Boulevard in Westwood in June 16, 2014. 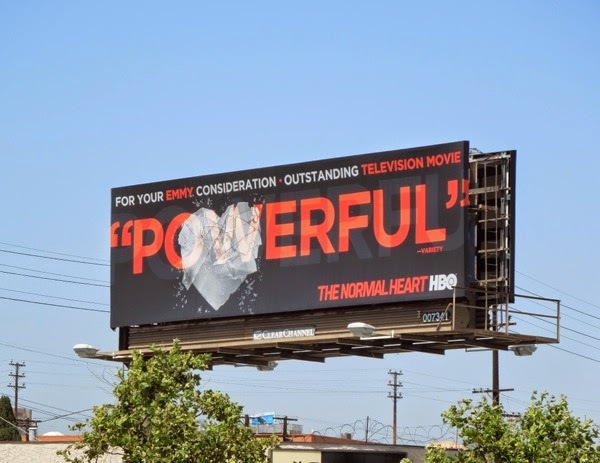 This one is for the adaptation of Larry Kramer's play about the 80's AIDS epidemic in New York, The Normal Heart, and 'Powerful' is certainly an appropriate word to describe the compelling HBO TV movie.